Speaking of tabular data, let’s review a small set of the pros and cons for using Excel and Project when managing a Gantt chart. When users need to get into any of the above, it’s a good idea to start using Project, so let’s think about how to import the data. There are a couple of ways to import Excel data into Project, so let’s start with the easiest, which, of course, is copy and paste. In order to start this off, I’ve been using an Excel template call Project Planner, which matches my current needs of recording activities and durations. Note that one of the issues with this type of Excel file is the lack of fidelity in the durations. I’m limited to weeks in the Project Planner template. To import the tasks, I can perform a simple copy and paste of the activity name from Excel to the Task Name in Project. As you can see, the paste has created new tasks, but because the Task Scheduling mode for new tasks is set to Manually Scheduled, the tasks are created without any duration, start, or finish dates. If I do that again, but with the Task Scheduling mode for new tasks set to Auto Scheduled, you will see that durations, start, and finish dates are created and Gantt bars can be displayed for each task. Note that any formatting applied to the text in Excel is preserved during the paste. If I wanted to reset the formatting back to default, I could either immediately use the smart tag and select Match Destination Formatting or use the Clear Formatting button from the ribbon. The next thing we can do is import the duration. After all, it is a field in the Excel file. The issue here is that the default duration value is set to “days,” and therefore when we import the duration value, it is expressed in days. As previously stated, the Excel file has the duration in weeks. Using the Project | Options dialogue box, we can change the default duration to weeks and then re-paste the data. Note that you may have to reset the durations back to “1day ?” prior to re-pasting. We also have the option of importing an existing Excel workbook. Before you import an Excel workbook, you need to do a little work on it because the Excel import expects a simple list with optional headers. It doesn’t really handle blank lines or merged cells very well, or at all. To get around this, you should copy and paste the relevant items into a new sheet. Now you’re ready to import the Excel file. Remember to change the file type from .xml to .xlsx in the file open dialogue box. You’ll be presented with a wizard, and it’s really just a question of walking though the various screens, as shown below. Choose whether to append to an existing project or create a new one. Then, choose what to import. The Excel file only contains tasks, and each column has a header, so you’ll need to select both items. The next screen is where the mapping of Excel fields to Project fields happens. Select the drop down list to choose the fields to. Fields are mapped automatically if the names are the same between Excel and Project. Note I have chosen not to bring in the Actual Start, Duration values, or Percent Complete. If this process is going to be repeated, then it is worth saving the fields in a new map. The mapped fields are imported into Project, using the default settings. Remember that the duration had already been set to weeks, and in this instance, because both the start and duration fields were mapped, Project could work out the finish date. 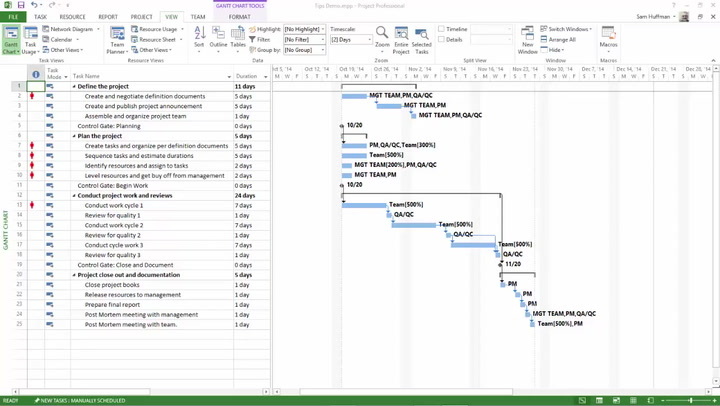 Now that the data is in Project we can begin to finesse it, change the task types, enter or modify start dates, or even better, create dependencies between the tasks (there is no way to easily convert the week number that the activity starts in the Excel file to a relative week number in the Project plan because Project works with real dates). We’re going to finesse the schedule somewhat, changing the durations to better reflect reality, and adding in dependences and constraints where necessary. We can now easily visualize the different phases of the schedule, the milestones, and the interdependencies between tasks. Project even tells us when we’re due to finish (remember you can set the start date of the project via the Project tab, the Project Information button, or simply set the start date of the first two tasks). Already this Gantt chart is easier to read than its Excel equivalent, and it gets even better, as a quick selection of the checkbox to show critical tasks displays the critical path. That is, those tasks whose duration should not be delayed if I want to deliver the project in the shortest possible time. For those of us who have worked with Project for some time, this is not a revelation, but I have worked with customers who have experienced a “eureka” moment at seeing this. We’re going to add some resources as assignments to the schedule. We’ve covered moving Excel data into Project, but it’s often useful to export Project data into Excel, especially from a communications and reporting perspective. In this example, we will produce a “who does what when” report, which used to be in Project, but was deprecated in the 2010 release. The simplest way to get at this data into Excel is to use the Resource Usage view, add in both the start and finish columns, highlight the data, and copy and paste it into Excel. A more sophisticated and repeatable way to export data is to use the Visual Reports feature, which can export data to either Excel or Visio. There are many built in templates, but you can also build your own. Project exports the data to Excel, and as long as you know about Pivot Tables, it’s easy to create your own reports and charts. Information on how to use Pivot Tables can be found in Excel’s help files. For a “who does what when report,” select Assignments during the mapping process and choose the fields to export. Note that the Task GUID is included in this report, but isn’t necessary. Each set of exported data (tasks, resources, and assignments) is placed in its own table in Excel, which can then be modified and handed out to resources, as required. A simple modification is to sort the data by Start Date. In this article I’ve discussed importing data from Excel to Project (typically done when users reach a limitation with Excel in terms of managing a Gantt Chart). Importing can be as simple as copy and paste or more sophisticatedly by using the Import Wizard. It is also possible to take data the other way, from Project to Excel. Sometimes this can be as simple as a copy and paste, but we can also be a little more sophisticated by using Visual Reports or the Export to Excel wizard. All three methods produce great results, and you should experiment with each one and settle on using the one, which works best for you and meets your organization’s requirements. If you want to check out the plan that I used to create the article and the other associated files they are available for download here. I can’t see any critical path in MS Project – There are only critical tasks with out slack/float. Where is the critical path in this plan, I can’t see the tasks on the critical path – only critical task!!! But someone must stop talking about critical path in MS Project! I’m confused by your comments re Critical Path, if you would like to explain a little more then I would gladly try to help. BTW, no problem viewing the CP. Thanks Josh for the feedback… that was my thought too. Thank you very much for the article & material, using which I was able to understand & reproduce your same results. In particular I appreciated the ” Who Does What and When ” graphical Report which will be very useful to me. But now I have a problem: a Client of mine wants a ” Who Does What and When ” Report not only in Graphical form but ALSO in Tabular Form i.e. the Resource Usage View exported in Excel. I could do it using cut & paste but it’s terribly difficult, time-consuming and NOT automatable . Can you suggest a better way to produce this kind of Report ? Perhaps using VBA ? Any help will be highly appreciated !! You need to use fields such as Outline Level and Milestone. Insert these fields into an existing Project Plan and you will understand the role they perform. If the fields exist in the Excel file and they are mapped correctly then of course they work as expected.